The facade of Daniel and Mirella Levinas’s mansion off Wisconsin Avenue looks like many white-brick houses in Georgetown. Greek revival details convey patrician heritage and conservative taste without a hint that behind the pilastered doorway is a pristine, ultra-modern museum. Inside unfolds a domestic variation on the gallery style known as “the white cube.” Walls and floors are rectilinear planes stripped of decorative flourishes, and rooms are a sea of white, relieved here and there by a patch of muted color on the sparse furnishings. Where you would expect to find furniture, curious functionless objects beckon. The first thing you see is a stack of Warhol-style Brillo boxes made of puckered paper, covered with hand-drawn logos and lettering in black and white (by Spanish artist Javier Arce). In the foyer stands a white monochrome figure with a clutch of colored fluorescent lights slung over his shoulder (Catalan artist Bernardi Roig). A translucent fabric scrim that at first looks like a solid wall becomes a screen for a surprising video projection. 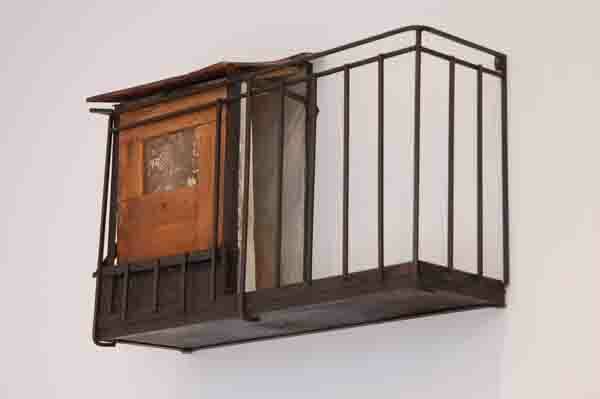 Juan Munoz, Balcony, is mounted high on a wall. It feels so much like a public gallery that you have to remind yourself that you are visiting a private home. Some people collect stamps, cars, guns, stuffed animals, wine or Civil War memorabilia. The Levinases collect contemporary art. The Argentine couple have hundreds of sculptures, paintings, drawings, photographs, videos and artist books, mainly by younger artists from Latin America. The list includes prominent figures such as León Ferrari, Vik Muniz, Cildo Meireles, Matthew Barney, Olafur Eliasson, Liliana Porter and many others who may not be household names, but who have soaring reputations among experts. But the couple are known particularly for discovering talented artists. “They’re not looking for the proverbial painting over the couch,” says Leigh Conner, owner of Conner Contemporary Art in Northeast Washington. “They’re very adventurous collectors, open to what art can be, whether it’s a video or a sculpture made of forks and paper plates,” she says, referring to a hedgehog-like assemblage of plastic dinnerware by local artist Dan Steinhilber that the couple purchased from G. Fine Art. That piece — among the few by local artists currently on display — occupies a nook in Daniel’s book-lined study. A nearby balcony overlooks the living room, a cavernous, light-filled chamber with double-height ceilings and a polished stone floor that extends some 30 yards in length. Sunlight floods in through a floor-to-ceiling glass wall onto a seating area around a square table laden with art books and small sculptures. 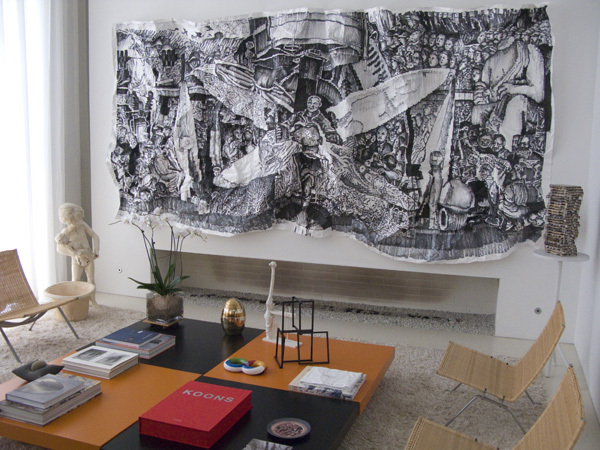 Mounted above a recessed fireplace is a crumpled-paper mural with a black-and-white rendition of a famous fresco by Mexican master Diego Rivera (also by Arce). 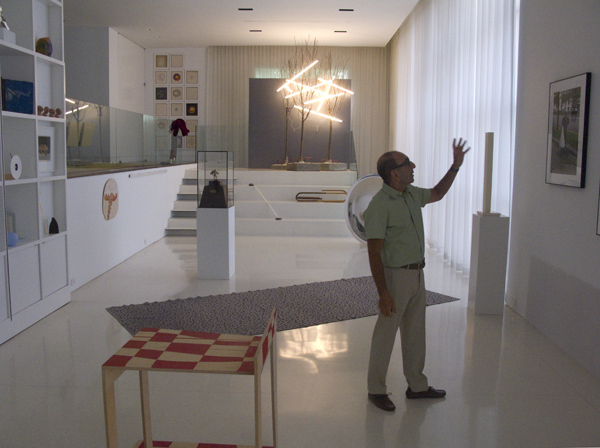 Around the room, sculptures rest on pedestals or directly on the floor, culminating at the far end in a raised mezzanine where dried trees bloom with fluorescent bulbs (Spanish artist Carlos Schwartz). 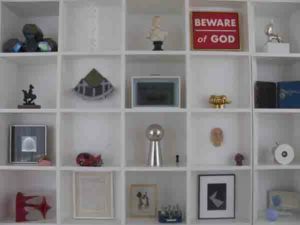 Cubbyhole shelves contain a miscellany of framed photographs, drawings and precious objects. And the entire glass wall retracts to open onto an enclosed patio where a giant Dixie Cup-shaped fountain continually pours water into a swimming pool. We’re a long way from the conventional image of inside-the-Beltway living. These days, wealthy collectors often hire curators or consultants to tell them what to buy. The Levinases do their own hunting. “It’s part of the excitement,” Mirella explains, ticking off a list of recent expeditions from New York to Basel, Madrid to Mexico City. Their next trip is to the Venice Biennale, with stops in Trieste, Italy; Ljubljana, Slovenia; and Berlin to visit artists’ studios. “Some people enjoy going to the beach, and some people enjoy going to a museum or to see an artist or installation. For us, to see art is pleasure,” she says. For slide show of works in the collection and to read the complete profile click here or one of the images above.